O's boyfriend is a beer-lover. O is my sister. She and her man live in the Bay Area. He was told by a customs officer that if he loved beer, he HAD to try this one local Toronto microbrewery. Having realised, too late, that we missed the one and only tour they do per day (WTF), we decided instead to make sure we took him somewhere he could have some nice beer. We had a decent selection earlier in afternoon at the Beer Bistro on King so I had high hopes for the Bier Markt. Admittedly, I had not been there in over 5 years and back then, it was only to throw back some cocktails with some girlfriends. I was sorely disappointed by the revisit. It's funny because given the pseudo swanky exterior with the awning and carpet, you expect something entirely different to the dowdy, heavy, wood interior. No matter, we were there for the beer and food. Second disappointment was the beer list. Whilst there was a variety, it was rather 'run of the mill'. Alot of big names and very few local beers. It was not what we expected from a place with Bier in the name. We 'settled' on a couple of acceptably interesting, yet unfortunately, branded beers. Third disappointment came from the service. Our server was pushy yet absent. How does he do that? We rarely saw him. Both our kerosene table lights burnt out while we sat there and no one came to relight them. We never saw a refill of water. Yet for the brief interludes that he was with us, it felt like he was trying to sell us a used car. Even A, O's boyfriend mentioned it and he's quite sympathetic to service staff since he spent time as a waiter as a student. Fourth disappointment was the food. The food was, well, not good. I had the Swiss Beer Fondue. It came with an assortment of Gerkins, Asparagus, Tomatoes and Bread. The dippables, though quite mean in portion size were the only good thing on my plate. The Cheese was barely above room temperature. The tinly little votive did little to nothing accept add to the ambiance particularly since two of our table lights had burned out. It was Swiss and Emmenthal, both nutty and distinctive cheeses. The Cheese fondue, sadly, was VERY floury and bland. It was all filler. Very disappointing for the size and cost. O had the Smoked Gouda Fondue with Bacon. The Bacon and smokiness helped 'mask' the filler fondue but that floury texture was still there. It was like eating papier mache paste. She only ordered that after the special of the day was sold out and we were there for an early supper. A decided to order the BBQ Chicken Flatbread. It was dry and sadly topped. We don't recall the dish being described as including mushrooms but they were all over the bread. I didn't mind because I took the discarded Mushrooms from A, who hates them. We considered ordering more drinks but we never saw our server again. Our food was brought by two very efficient food expediters. They were polite and fast but also did not relight our table lights or offer us any water. We were soooo close to opting for Fiona McCool's one door down and we really wish we had. Queen Mother is one of those annoying places that people from Toronto get hooked on and can't get over. It only takes one bad experience and you are happy to be liberated. Four of us were meeting up for a Holiday catch-up and only K wanted to eat here but none of us, well except me, wanted to object. S and J both, still living in Toronto, wanted to eat there less than I but did not want to fuss for the brief time we had together. I on the other hand had just had a bad Pad Thai the evening before at Supermarket in Kensington and knew the only thing I liked on the Queen Mother menu was their Pad Thai but still not enough to have it twice. K recently moved to Calgary so had an all too familiar hankering for the familiar and comforting. We talked about moving on after drinks when we were seated but I knew that meant we were parked for the evening. K was set on having their Sticky Rice with Peanut Sauce and given their agonisingly slow service, we knew that even as a starter only, that would not be a quick bite. 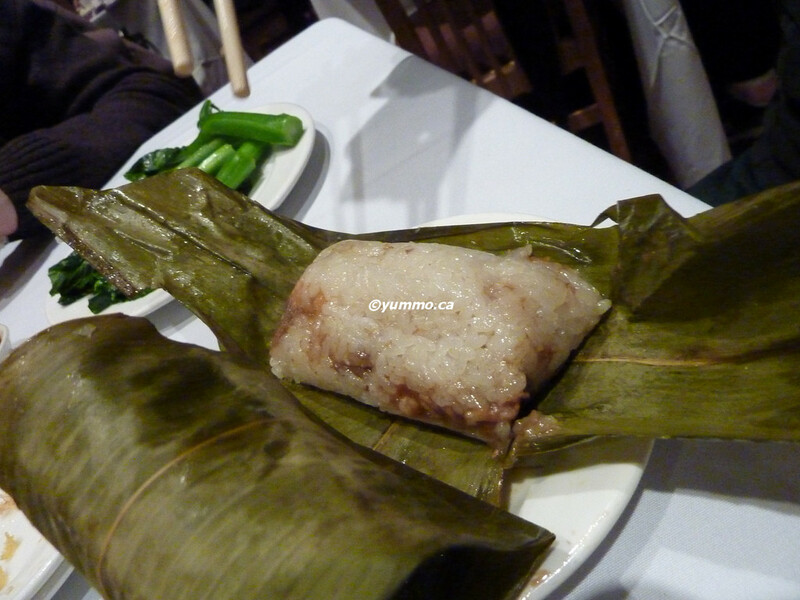 We even noted we could get way better, cheaper and quicker Sticky Rice a few blocks over in China Town. Futile to even mention really. Their Sticky Rice is good. It's really the sauce that does it. I would really prefer if they just went all Asian instead of ill concieved UN foodcourt menu. So we settled in and ordered some wine off their VERY limited and uninspired winelist. J had only planned on a drink but decided, in error, to order some Spring Rolls. She was in it for the long haul too. S ordered an Italian Chicken Special. I had the what I hoped would be the most innocuous and foolproof dish, the Vegetarian Roti. K ordered the Pad Thai. So what are you finding incongruent with this array? That I am sat at this table is the first thing. The second thing is the reason my presence at this table is amiss. I do not like restaurants without a consistent direction. Jack of All Trades is a Master of None. I just made that mistake last night at the Supermarket. What am I doing here, I railed in my head. For crying out loud, we just ordered dishes from five distinct culinary origins. How could they possibly think this was a good idea. Dude, I cannot bear those places you cannot describe to someone who asks what their genre is. Not to mention we are taking this all in in a cafe named for the English monarch's late mum, which is decorated like her musty sitting room and lit so low you could go blind. Of course there are non-chalant, indifferent, at times snarky staff. All waify, bohemian-esque women who make you feel as welcome as a fart in an elevator. Even in the slower times, you should expect to wait considerably long intervals for a visit. The trick is to order it all when you are fortunate enough to have their attention. Since we waivered on staying, we did not and thus waited even for a refill of water let alone completing our order as S polished off her Chicken. So what of my harmless Vegetarian Roti? It was incredibly dry. Dry Dry! It came with no sauce or side sauce. If it weren't for K's leftover Peanut Sauce from her Sticky Rice, it would have been inedible. There was notably more wrapping than stuffing and the curry was notably closer to South East Asian than the Caribbean from whence the dish should have hailed. I think the next time we leave the suggestion for the reunion hanging, I'll jump in sooner :^D. Though admittedly, it's harder when you can't keep up with the newer places and we try not to be too extravagant since we out of towners are likely to be eating out more than in while in town. Still, I'll do my research and not repeat this tradition. If you attended McGill University, Amelio's pizza will undoubtedly conjure warm, cheesy and satisfying memories. There is a sort of unspoken allegiance to this small, unassuming, family run, Pizzaria in Montreal's 'McGill Student Ghetto'. Having eaten a lot of pizza over the years, there is nothing quite like Amelio's. There is definitely a loyal following of McGill Alumni who still frequent the old and new locations. A friend of mine recently had a homecoming reunion in Montreal and they had an Amelio's pizza night for dinner. Since there were a rather large group, they ordered out and squatted in their old student lounge. I have had a craving to go back for some years now. For one reason or another, mainly the brevity of the visits, I have not been able to drag D there. It does not help that they are closed on Sunday's which are most likely to be our family-free days. Luckily for me, they recently opened a new location on the swankier Bernard Street in Outremont. A far cry from the modest environs of the Student Ghetto but smelled just as good. The owner is the daughter of the original Amelio's. She returned from a banking career in New York to follow her true dream. She mentioned that she does have a regular flow of McGill Alum up there who have now grown up and bring their kids. I know I would if I lived there. The new location is alot brighter and cafe like than the original but still served the same free starter salad in the wooden bowls with shaved carrots. She admitted the staff and the kitchen are quite new and were probably not as well equipped to handle the traffic of the other location. I'm sure it will come along with experience. The tastes were definitely authentic. Why did I feel so compelled to track this place down? Well, one particular dish which has eluded me, lo these many years, the Eggplant Parmesan Submarine Sandwich. I have not found it anywhere else, definitely not in Vancouver. There are lots of Roasted Veggie subs around but not the Eggplant Parm sub. As well, you will rarely, if ever find a Vegetarian Pizza in many cities that have Eggplant as a topping. MMMMMM So I dragged D, in the bitter cold of a Montreal Winter across town, despite the fridge at his parents heaving with leftovers so that I might have my Eggplant Submarine. We brought the food back so we could eat with his parents. We ordered an All Dressed and a Vegetarian. We ordered two Mediums and the nice owner suggested we order a half half large. We would get almost the same amount of food for less money. But we decided to ordered the two pizza's just in case his folks were hungry. The Sandwich was just as I'd remembered it. If you carry it out, the toasted bun becomes slightly soggy but in a good way. It is heaped with the same shredded, fresh iceberg lettuce which too will soften on route which is actually a good thing since the overflowing sandwhich would not contain it otherwise. It has a considerable amount of melting, oozing cheese. D thought a tad too much not for memory lane, it was just right. At the core was the wonderful Eggplant Parmesan. It was slightly more salty than I would go for but the sandwhich as a whole was not too salty. Yummo! I can't wait for my next annual visit and fix! The Vegetarian Pizza was just as wonderful. Heaping with fresh and roasted vegetables and even more cheese, it was perfect for the blustery Montreal winter outside not to mention the long nights spent in Engineering study rooms. D and his folks made a funny observation. 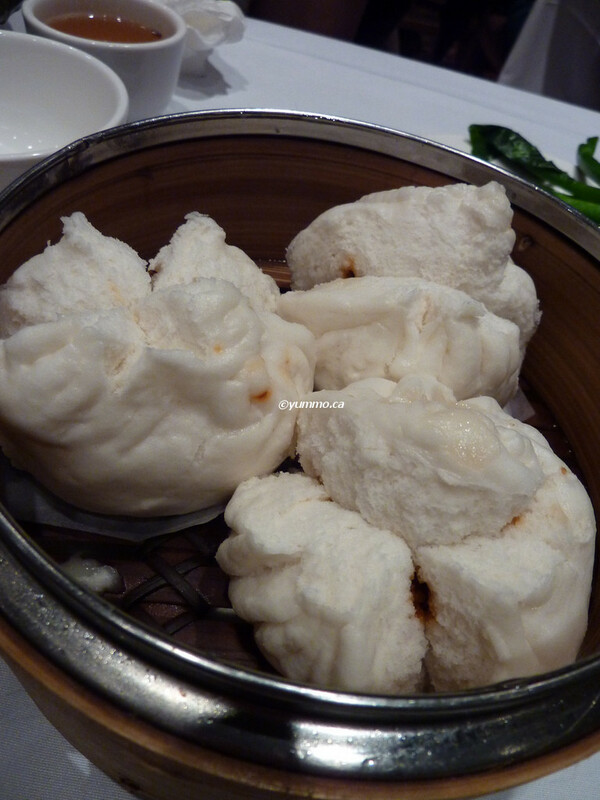 As most cuisines do, there are local adaptions. Like Curry or Korean food in Spain was never very spicy. Well, in Montreal, most Pizzerias have French Fries on the menu as well as an Italian Poutine which is basically fries with Bolognese sauce and cheese. I brought back the takeaway menuAmelio's does not A perfect way to end my visit. We haven't fully worked out the kinks on where to go for Christmas. It has fortunately not been too hot a topic since D is not really fussed either way whereas I am. Also, fortunately, he's very pragmatic and spending an additional grand to do a weekend hop for a dinner is on the excessive side. That said, it does mean alot to his folks. Thus we did have an early 'first' Christmas with his family, my Belle Famille (in-laws) in Montréal this weekend. Since we waffled back and forth about the dates and who would go when, we ended up paying through the nose. In the end D is spending the rest of the week there and I am back in T-Dot with my family. Then we'll send Christmas weekend with my family. Whenever I hear the saying "Soup to Nuts", I think of D's mom. Actually, I only heard the saying for the first time a few years ago when I moved to Vancouver. It's the dining and less morbid equivalent of cradle to grave. That said, her meals are more aptly described as "Nuts to Cheese". There are always a selection of nuts. She spiced some Walnuts, Pecans, Cashews, Almonds and Hazelnuts with Cumin, Paprika, Brown Sugar and Cayenne. As well, she had plain. The day before, she made some Parmesan Tuiles. Simple melted piles of Parmesan Cheese that look fantastic, and taste insanely addictive. A crown Jumbo Prawn cocktail and Roulade of Soft Cheese and Proscuitto made the rounds. This was all accompanied with some Pommery Champagne. This was all planned before appetisers. Dinner starts at 8pm. Turkey will hit the table at 9pm. Want the Turkey to brown after roasting and rest for at least 20 minutes. So the Turkey, stuffed and slathered in Sage Butter went into a 450F for 30 minutes with the cover on. The oven was then reduced to 325F. It was basted every 30 minutes for 4 1/2 hours. We then took the lid off. Put some foil on the legs and wing tips and continued for another hour with the lid off. The result was an incredibly moist bird. Even skeptical D who wasn't sure about the covering, had to admit that. For the salads on the table, we had a Black Tomato and Fresh Basil with Olive Oil Salad. They were lovely for winter Tomatoes! That was fairly expected as a salad for me. What was less so was the traditional family table accoutrement of Celery and Black Olives. They're not oil cured or salt cured. That is not to say that they do not like other Olives. D loves good olives. These are tinned pitted Olives. The dish was something D's Grand Mere used to make and it has appeared on the Christmas table for decades. It's not dressed as a salad but it is served this way year in and year out. The celery needs to be cut a very specific way though I didn't catch how. Starters were a Ceviche of Scallops in fresh Lime and Grapefruit Juice with peeled Grapefruit segments. For the less brave, there was a cooked Shrimp version. Yum! Surprisingly, D's young nieces lapped it up. I don't know if I was adventurous at their age. D's family serves the Turkey carved. Out our house, mom goes for the theatrics which can be tiresome especially when she makes a 20lb Turkey when only 4 people actually eat Turkey. Oh did I mention mom won't eat leftovers. Anyhoo. The Turkey tonight was visibily tender and moist. D loves the dark meat for the very reason I can't eat Turkey, the turkeyiness in the fat. Not pour moi! On the side was Mashed Potatoes with 1/3 Orange Sweet Potato. D's family always tops with Green Onions. D's Oncle F doesn't like Onions. I can't imagine a life without Onions but many others couldn't imagine life without Turkey so to each their own. So they're used to having to setting a side a dollop of Mash without Onions for F. There was also Sage and Mushroom stuffing that was made in the bird. Stuffing doesn't photograph well so there isn't one. There was a bit of a kaffufle about the Stuffing actually. I hadn't encountered this misunderstanding in almost a decade so I was a bit suprised and probably responded slightly more forcefully than necessary but it was because it was THE most common and aggravating lack of understanding about my dietary choices. I do not like the taste of meat. So, there is not Turkey Meat in the Stuffing but it was certainly soused in it and cooked for 5 hours in it so therefore IT IS NOT VEGETARIAN. In fact, since most of the flavour of meat comes from the fat, it smelled more of Turkey than the Turkey breast. Blech. Even if I were a moral vegetarian, the argument that there was no Turkey meat in the Stuffing fall over. Grrrrrr. I had said I'd be happy with the sides and I meant it. With the Nuts to Cheese, I had more than enough food. For first dessert was an assortment of Cheeses and Dried Nuts and Fruit. We served it with a nice Buller Fortified Wine. For real dessert was the Bouche de Noël / Birthday cake. D and his Niece G share birthdays around Christmas so Christmas Dinner always has a birthday cake for them. Poor little D had several birthdays a child completely forgotten. He'd grown quite accustomed to combined birthday presents or nothing at all. He never minded. So now the tradition of the Chrismas Birthday cake is a great way of making sure he's celebrated. And of course my mom will INSIST he has a cake at ours. He comes back to ours on Christmas Even, the same night as my sisters. Yay! Holidays are not only conducive to overeating in general but overeating out. This is exacerbated by living away from home. The easiest way to catch up with friends and family is over food or a drink. So only after my disappointing Mexican disaster at Hernando's I was catching up with my cousin H only a few hours later for a Winter Solstice festival in Kensington. It's funny. H has lived in the Queen West area for nearly a decade and she's never been to this annual, grass roots festival. For the evening of the Winter Solstice, there is a parade through the streets of the Kensington Market. Parade is probably a bit of an exaggeration. The roads are closed off by the police so it's pedestrian friendly as the local drum bands and musicians walk through the area. People in costumes everywhere and carrying large home made lanterns. It was fantastic. Though, as it was H's first time, she thought we had time to eat dinner before going to the parade. As it turned out, we ate through most of the walk. No matter. We caught up with the culmination in the nearby park with the fire eaters, jugglers, drummers and burning of a giant effigy of a haida Raven. We did see quite a lot of pieces of the parade as we wandered through the area looking for food. I had a wicked Phad Thai craving. Toronto has great Thai food and it is as ubiquitous as Sushi is in Vancouver. 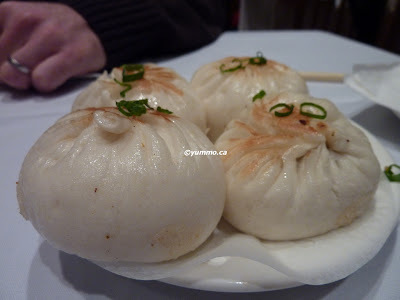 Equally though, the range of quality and authenticity varies like Vancouver's sushi as well. We found one Thai restaurant that offered Hungarian Thai food. As I could not imagine what that meant, we walked on. Sort of regretting that now. At least they had a theme. I am so tired of restaurants without a clear concept. Sadly, it is so common in Toronto's entertainment district that is becoming a concept in and of itself. Spent enough time in the downtown Toronto, you know what I'm talking about.... sat down in a kitschy, bohemian, laisse a faire decorated joint to a menu that includes Asian, Caribbean, Burgers, Pizza and the like all on one menu? Yeah, you have. Sometimes they guise the melange as being linked by a non-cuisine related theme like all organic or all Vegan. Usually tenous but more often though, it's just a melange to hit all craving options. Supermarket is one of those. The kind where, you have to recommend the restaurant specifically rather than the cuisine you fancy. Blah. Given the funky location and plethora of more honest cultural bakeries, grocers and restaurants, I had greater hopes. If I had walked into the place in any other area, I would have thought it was a country roadhouse. Big wooden beams, plank floors, homey tables and stage in the back with a lot of loud music. Still, H had mentioned that they had Phad Thai, and that was all I wanted. So to order here, you have to fill out a check list form. We ordered drinks after a notable wait. Then we ordered Yam Chips to share and H ordered an Oxtail Stew. To choose my Phad Thai, I had to select the Protein and the heat. We accidentally chose the Vegetarian but the heat level for the item above. A server took our order sheet blindly and entered it into the POS. Another server, the third, brought us our drinks and so it went. Before I move on to the arrival of our mains, I want to point something out. H and I were sat a small table for two. Oh and should I also mention that we are two, rather diminutive Asian women? So Why or Why would any server think we would order two Phad Thai, Oxtail Stew and Yam Chips???? Wouldn't most servers or restaurants verify our order before mindlessly entering it into the ordering system? Wouldn't most restaurants or managers choose to apologise for the misunderstanding instead of blaming their clientele for filling out the form incorrectly? Wouldn't most managers not give us the impression that they were doing us a favour by not charging us for the extra Phad Thai??? The Chips were okay. Though I will admit now, as tasty as they sounded as looked as others ordered them, it was not the best pre-Phad Thai appetiser. That is what is wrong with this menus with personality disorders. H's stew was heavy and underseasoned. As well, since they brought me the Chicken Phad Thai to start, H decided to wait as they corrected it and so it was cold by the time we both had our food. She ate about half of it. My Vegetarian Phad Thai, did nothing to abate my Toronto Pad Thai craving. It was not Pad Thai. It had most of the elements of Phad Thai (I'm using both spellings for search purposes ;^D), the right Noodles, Sprouts, Tofu, Peanuts and other veg. That's where it ended. The sauce was all wrong. It tasted alot more like a generic Asian stir fry than a Pad Thai, a very underseasoned one. I almost asked for Soy but after having been chastised by the manager for filling out the long-form in correctly, I chose not to. There was little if no hit of Tamarind, Cane Sugar or even the ketchup fake out which is closer than this was. So as a stir fry, it was hot, fresh but as a Pad Thai, NOT. I think I should have tried the Hungarian Thai place a few doors down. Live and learn. Oh and do your homework before being dinged and badgered for filling out your OWN order form incorrectly. ....or, or, go somehwere else, where there is some human intervention and customer service. If you fancy a nice Mexican fix while roaming downtown Toronto, I'd recommend Taco Bell before Hernando's Hideaway. It's places like this that give Mexican food a bad profile. For this price range of 15-20$ mains, I'd expect a great deal better than this of any cuisine. So when I pay 20$ for a meal I could have purchased in a foodcourt, I am not only disappointed but offended for my Mexican friends. As well for this range, I was rather disappointed not to be served chips for table. I'm not being a snoot either. I have had Mexican street food in small villages and on the beaches of old Puerto Vallarta or the most awesome burritos in San Fran's Mission district. I have also had lovely, autentico homecooked Mexican food made by an old flatmate. He'd be disgusted and insulted by our lunch. We hadn't planned on Hernando's obviously. We were some of the few saddos in the office a few days before Christmas so we decided to step out for a nice lunch. 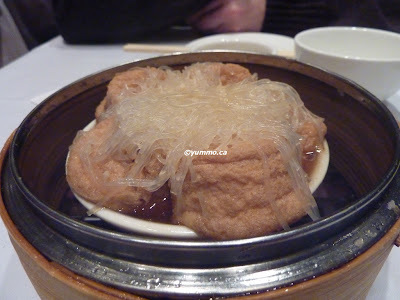 We were turned away from full full restaurants in and around the Old Town of Toronto. We even hit pubs where there'd be a questionable selection of meaty stews, and fried foods that now, I'd sooner have sat down to. You walk into a gaudy painted and loud dining area that reminded me of bars I used to frequent university. I wouldn't have been surprised if my feet had stuck to the floor. Strange, given the area. Two of us ordered the Fajitas and N ordered the Black Bean Soup and Chicken Nachos. We were asked for our order a couple of times by different servers. I was surprised and disappointed that I couldn't request a Seafood Burrito. They had a Seafood option for most of their menu items but not the Burrito. I reckoned they'd be somewhat accomodating and simply replace the strips of chicken with the sad little shrimp I later saw on my Fajitas. They would not give me the sub. Fine. So I ordered the Fajitas. I hate ordering bad Fajitas with work colleagues at lunch. Bad Fajitas are normally all socially challenging semi-raw Onions, as these were. As well, they're terribly messy to eat which renders polite work convo/gossip pretty impossible or padded with dozens of extra napkins. 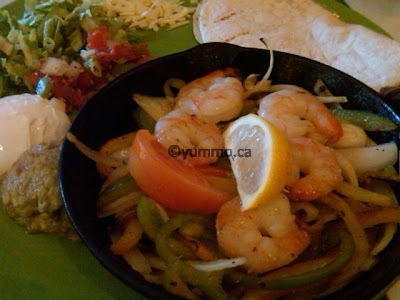 The sizzling pan came with that predictable, unseasoned, flavourless heap of Green Bell Peppers and Onions topped with 5 sad looking, small, shrimp. They did not come with any refried beans so I ordered a side. The Beans were bland and as loose as soup. The other sides on the plate like the Guacamole was also bland and without personality. Speaking of soup, N's Black Bean soup was closer to a Bean dip than a soup. It had a gloopy and sloppy texture. It was bland, under seasoned and under spiced. Then she received her Nachos. Her Nachos .... seriously, how can you get Nacho's wrong in a Mexican restaurant. I've seen better Nacho's in TGIF's. These looked like the type someone might do poorly at home. They were sparsely topped with a few Tomatoes, a few dried pieces of Grilled Chicken and lots of greasy Cheese. It did not come with any sauces or salsas. We were not revisited by servers despite the half empty dining room so that she could order some. It will not be seeing a repeat visit from any of us and I would not recommend a first for you. Guys think it's the ladies with the cravings but it's them as well. D had a sudden yen for a lot of Mushrooms. I do not mean that he fancied have a mushroom or too. It was quite specific. After breakfast, he said, I think I'll go by TnT today after the gym and "buy a lot of Mushrooms". And for that fan out there of my syntax, yes, he verbally capitalised it :^P. Brush the Mushrooms clean and trim the stems. I would not recommend washing them because they'll soak up the water and make browning quite difficult. If you do wash, pat dry, thoroughly. In a large skillet, heat some Olive Oil on high (do not use Extra Virgin, it's a waste of it), enough to coat the pan when heated. Add the mushrooms in batches, just enough to mostly fill the skillet in 1 layer but room enough to breath. If you crowd the pan, you will just steam them. Leave some dancing room. Do not start moving them right away. Let them mingle for a 1 minute, then move, sit then move. Too much moving will steam not brown. Half way through, add some of the Herbs. Parcel enough the Herbs out to go in with each batch of Mushrooms. After 3-5 minutes, set aside on a plate and do the next batch. In a sauce pan, bring the Broth to a boil. I use an instant, Organic, no sodium Vegetable broth I bought at Whole Foods. I steer well clear of all broths or cubes who's first ingredient is Salt and in the liquid form, second after Water. You can use Chicken Both if you prefer. I used to love the distilled, concentrated liquid instant broth they sell in the UK but I can't find it here. When all the Mushrooms are done, heat some Olive Oil in the same empty skillet on Medium. Move to using a Wooden Spoon if you haven't already. Add the shallot. Soften for 1 minute. Add the Rice and move around a lot to coat with the Oil. Add a splash more if you think the pan looks dry. 1 minute. Add the White Wine in a large circle sweeping the pan. Stir the rice. When most of the liquid is absorbed, add 1 ladle of Broth, stirring constantly. It's a labour of love, accept it. Adjust the heat as needed. Other than when you first added the wine, you should not see any violent bubbling. No bubbling at all really if you're stirring. The heat and speed I like is where the steam is quite actively wafting off the pan and the mixture looks like it's about to bubble but the stirring prevents it. On my stove that's a 4.5-5. When the liquid is mostly absorbed, i.e. you can draw a mote down the centre of the pan with the spoon and it does not close up on itself immediately or very fast. Add another ladel and continue. It should take about 30-35 minutes. Test the rice at about the 30 minute mark. You should cook to your taste. I do like it on the softer side than D but not mushy. D likes it on the edge of hard in the centre. I do not like carving it out of my molars. You can add more broth or water to your saucepan as you feel you need. At 1 ladel remaining, return the Mushrooms and add the Peas to the pan. 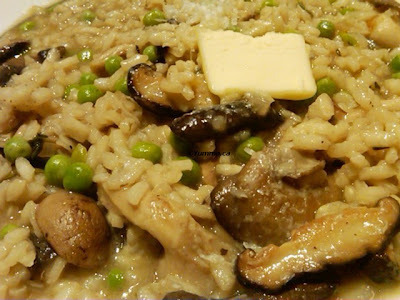 Stir gently because you don't want to 'dirty' the rice too much from the Mushroom bits. Add the Parmesan and incorporate, gently. Check the seasoning. Add the final ladel and stir once or twice. D doesn't stir the last ladel at all. Add the Butter in little pieces over top. Cover and set aside for 10 minutes. Serve with more fresh Parmesan and Truffle Oil if you wish. Some cracked Black Pepper to eater's taste. Saturday, December 4th - Japanese Feast - Okonomiyaki Artiste! I normally don't write up dinners at friends unless they know and are cool with my blog. I can't resist writing up S's big Japanese Feast. It was amazing and he is an amazing Japanese cook. Oh, did I mention that S is a programming guru who is not Japanese? That said, his attention to detail and committment to integrity of tradition astounds even his Japanese friends. He told me once that if a Japanese person fiddles with a recipe, it'll still be Japanese. But if he's cooking, he feels that he needs to stay authentic even if it's the modern version of some traditional dishes like Okonomiyaki. I love Okonomiyaki! There are not alot of places in Vancouver that have them. Actually, I can only think of one. I don't know if it's because of the set up you may need with the grill or because it's out of style. Shame either way. I mean you can get the Korean version in most Korean restaurants. But even then you won't always get the variety that S serves up. 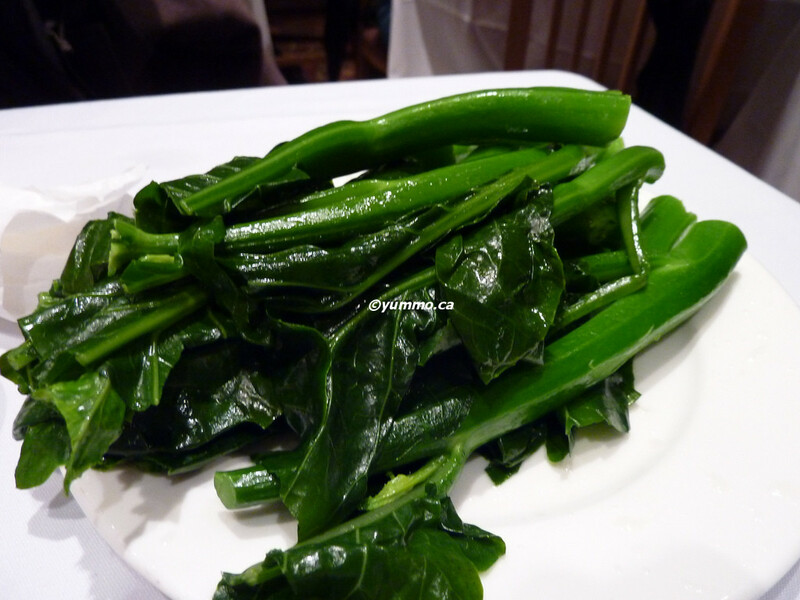 I don't have the recipes for most of his dishes except for an approximation for his scrumptious Gomae (Sesame Spinach). pre Phase 1: Steamed Edamame with Sea Salt and Yoshi Sake. 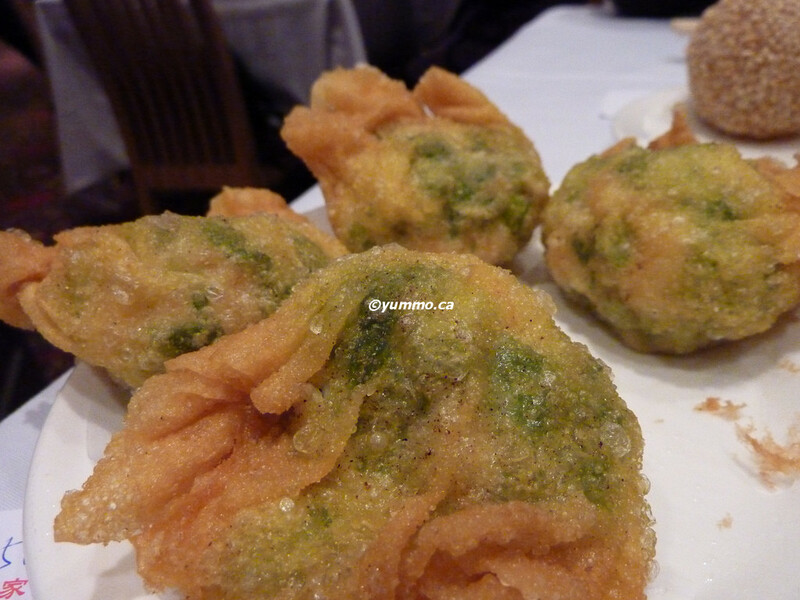 A yummy amuse bouche served as commonly as peanuts in most sushi restaurants and bars. MMMMM. 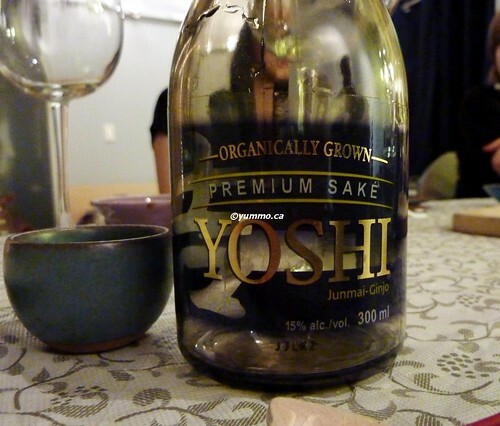 The Yoshi Sake is available locally and it was quite nice for the price point. Soft, subtle with no harsh edges. Okonomiyaki are pancakes made and served a la minute. They're a light Flour, Starch/Potato Flour and Egg based batter mixed with alot of shredded Cabbage as a base. They are normally topped with some Japanese Mayo, Okonomi sauce not too dissimilar to Hoisin sauce/Brown sauce. As well, often dressed with powdered Nori and Bonito flakes. 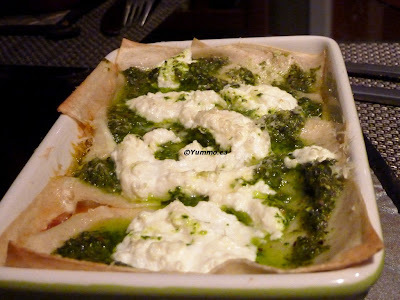 From there, you can get as creative as one would with Crepes or Pizza. That said, S is a traditionalist so he makes the ones he has seen in Japan or his Japanese friends have made. 2. Noodles - Mix in once the batter is poured but still raw, cooked, drained and dried Rice Noodles. 3. Variations of the two above with Shrimp. S was recently in Japan and brought back a real Tako Yaki pan. I lurves Tako Yaki. You've often see me blog about Japanese street food and if you refer to my Richmond Night Market post, you'll see they are the primary reason I go. I even bought this Dutch Pancake Puff pan from a local cookshop so I could try to replicate them. Though my pan doesn't have the lip on the edge to contain the overpour you're supposed to do. You should pour the batter across the pan so the full surface is covered and then poke and prod the batter into the cups and flip as the puff. The Batter was looser than the Okonomiyaki. 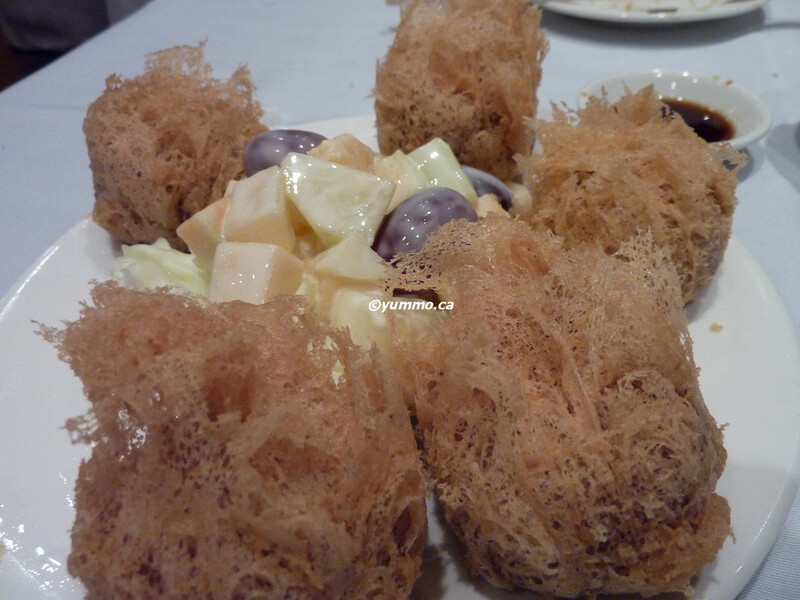 Traditionally, they are made with Octopus or Tako. You can get them with any protein really. S made them with Crab meat and Cheese for DJ who is allergic to seafood. As we waited for the alchemy in the kitchen to happen, S insisted we top up our bevvies. 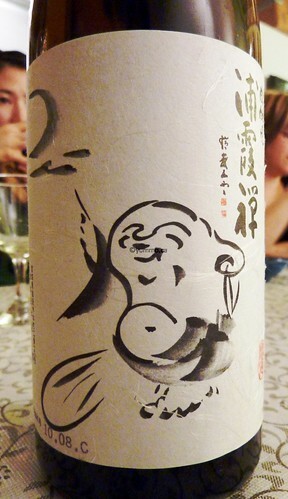 He brought out a beautiful Sake he bought whilst in Japan. It had nice pillowy depth. I don't often order this because it's more often than not, made with frozen Spinach and rather salty. But S's was amazing. I will definitely try to copy when I get a chance. It was fresh, bright and full of flavour. Sorry, I did not ask for proportions. It was not very salty so there was very little Soy. Also, I would suggest you go easy on the Mirin to start with. Do not over dress. I would suggest starting with 1 teaspoon of each and the mix to taste. 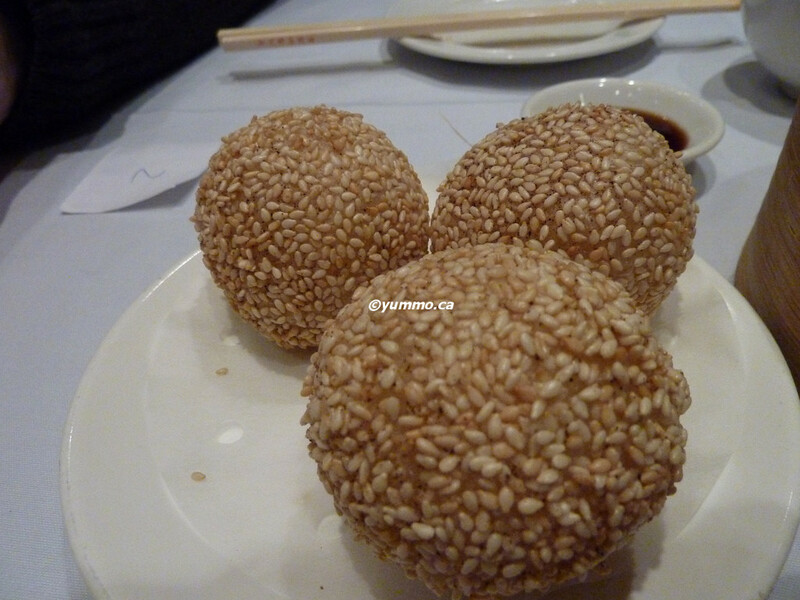 Top with a healthy amount of toasted Sesame seeds. Japanese Miso is alot milder than Japanese food. It's funny that I'm even describing because the bulk of the mass market have more likely had the Japanese variety than the bold, stronger and spicy Korean version. Japanese Miso done properly is gorgeous. In the lower end Sushi joints, they're normally using instant. The base for most Japanese broth is Kombu, large, thick sheet of Seaweed with Bonito Flakes and seasoning. The broth is drained to retain only the liquid. You would then whisk in good Miso Paste. S used to buy Japanese imported variety but now has started to use locally, fresh Miso paste. I would think this would mean there are less preservatives as well. The clear tubs with supermarket labels have a much shorter shelf life. He bought his at a Japanese market on Clarke. He served his with Soft Tofu and cooked Seaweed. It was sooooo good! This is truly a dish inspired by leftovers. I do not know why D took those Lasagna Sheets out of the freezer last week. There was no way, looking at the calendar we would have gotten to it. He was determined to finish them and the heaping amount of Parsley and half tub of Ricotta in the fridge as well. He had also taken a tub of our Vegan Bolognese out of the freezer a few days earlier and I nearly mistook it for Yogurt from the container. I'm much much worse between the two of us, as far as aversness to food wasteage. It literally pains me when we have to throw out a vegetable I have neglected to use. This time D was on a Lasagna sheet mission. The lasagna itself was super easy. Layers of fresh Lasagna sheets with Vegan Bolognese, Cheese, Ricotta, then Pesto, Ricotta and Cheese in two individual sized oven proof dishes. Bake at 400 for 20 minutes until heated through and the Cheese has melted. You could bake covered with foil for 15 then uncovered for 5. 1/2-2/3 c freshly grated Parmesan, the real stuff! No green plastic cones!! Place everything but the oil in your food processor. Blitz to break down a few times. Then on a slow run, drizzle in the oil. Add to the consistency you prefer. Will keep in the fridge for a week or in the freezer for much longer. It was sooooo good. The Pistachios gave it this amazing roundness that was amazing with the Ricotta. Mom tells me that Korean's are the largest consumer of instant Ramen per capita. I can really believe it. In Korea, you can get them in vending machines with a hot water dispenser! But I think within the 'instant' ramen gamut, there are categories and there are those 'more instant' than others. For example, the ones I would truly categorize as Instant are those you simply add boiling water to, cover for a few minutes and eat of the same container. The noodles have been parcooked and fried. These tend to be very high in salt and fat. There are the types that Koreans, all over the world buy in large quantities and they're the mid-instant. They come, most often, in foil-plastic packages and require a pot. The noodles are also parcooked though not always fried unless they are the really cheap end which you often see in the dollar stores or any convenience market rather than an Asian market or Asian section of a supermarket. They too are pretty high in salt and alas, like the instant type, often contain MSG. I probably spend 1000x as much time in a Ramen section than most Koreans because I'm standing there reading labels and comparing labels. Now on the higher end of 'instant' Ramen or rather Packaged Ramen is the type where the noodles are not parcooked and look like noodles that you would otherwise buy if you were making Ramen from scratch. The ingredient list looks alot 'safer' and there is no MSG. I like this variety. One particular, yet not obvious reason I like this variety as well as the obvious is they have fatter noodles :^D. Now, if I am looking for quick comfort, I'll pull one of these out but you will never see me eat these at home as is. I will always chop an Onion, Vegetable or Protein up to add to it. The only time you may see me eat straight up Ramen is at a snowlodge during lunch. If you buy a decent quality one, you'll get a decent soup base and noodles already portioned for you. 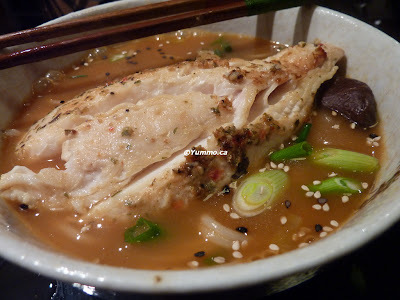 Tonight, D really really wanted to make some sort of Miso based soup to go with his Halibut but our Miso had expired. He lamented the size of the container I bought, which was soooo small but we don't eat Korean often enough to go through it fast enough. He was at a loss. I told him he should have planned ahead like I do which went over really well. So he started digging through the cupboards and asked about my organic instant Dashi mix and I explained to him that would only be the broth base. He then ransacked my Ramen stash. He decided it would have to do. On the package of the particular one he used, the broth looked like Miso but it was called a Spicy soup and it was definitely spicy and did not look like Miso when it was done. To dress up the Ramen, he added, Broccoli Florets, fresh Ginger slices, Garlic, Scallions, Parsley and Hot Peppers as the Broth Mix and Water came to a boil. The noodles can go in almost immediately following. He also added a few dried Shitake Mushrooms for flavour. I tried to eat them but they were super rubbery. D said they were just for the broth. He pan seared his Halibut and topped the steaming bowl of Ramen with it. Garnish with some more Scallions and Sesame Seeds. It was delicious. I promised I'd look for Dengjang (Korean Miso) the next time I was at HMart though. ﻿It's true what they say. It's harder to have too many choices. If you ask someone in Vancouver for a recommendation for GOOD Dim Sum, there is always a momentary, ponderous look to the sky and a follow up question. There are ranges of quality, price, and location. We have been looking and asking for a while now. If you ask folks in SFO, though the Chinese community there is quite established and ubiquitous, there will be a trending tide towards a particular joint near the financial district. There does not seem to be any consensus here. I don't know why. So what we do now when we ask for recommendations is narrow it down to preset parameters: 1. Must have carts so we can look at the food. 2. Must be about the food so decently priced so you know you're eating Chinese food and not some shi-shi fusion statement. 3. Must be good quality and tasty food. 4. Authenticity. We still get a few pauses and thoughtful silences so this time we gave up and went for the gigantic place in Chinatown that we're always driving by, Floata. It is at the heart of a pretty boring and waning Chinatown. Vancouver's downtown Chinatown is quite a disappointment. It is quite small. It is normally closed and deserted quite early and most doors are shut on Sundays. Most have made the migration to Richmond. I suppose, it's proximity to one of the most sketchiest intersections of Vancouver, Pender and Main, has had its role. 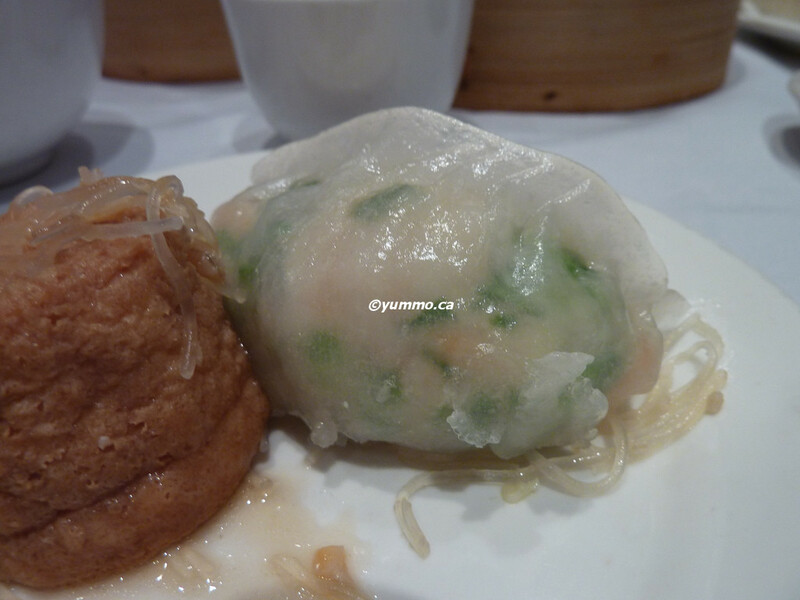 We have been to Dim Sum in Richmond but they weren't cart places and we ended up being nuisances to the waitstaff that struggled to explain the food and did not have the variety we otherwise would have eaten impetuously off the carts. The carts were constantly in motion but where not as frequent or in as large a number as the size of the room would warrant. So we waited quite a lot between visits from servers. There were also servers carry trays too, to order from. Dishes ranged in prices but the decent ones, and the majority of the ones we ordered for the three of us were considered 'large' and cost ~4-5$. You have to be patient and or, know what to ask for because they will likely be cooking it and it may well be making the rounds in some other part of the room. The carts tended to come out thematically so pace yourself and try to get a veg in. Steamed, Fried, Vegetable, Meat, Salads... The food was always hot, and fresh. You have to go out of your way to ask for condiments so ask when you have the attention of a cart. We ordered 9 dishes for the three of us which probably put it over the edge slightly as far as comfortable satiety but a last minute cart with Scallops with Taro paste couldn't be turned down. Still we did see some things on the grill as we were leaving that I had been waiting for and hadn't thought of. Oh well, it will have to wait for the next visit.